Work will be done over the next month to replace five water fixtures in Benton Harbor Area Schools. Those came back with lead levels above a more strict 5-parts-per-billion for lead adopted by the district, which CEO Robert Herrera says is well below the federal standard of 15-ppb. 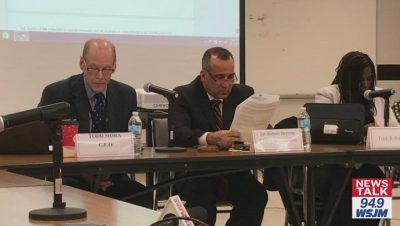 “The nice part about it is the number of fixtures that exceeded the five-parts-per-billion for a district our size were very minimal,” Herrera said. The tests were ordered after tests by the city found a handful of homes with elevated levels of lead earlier this year. Benton Harbor city officials have stressed the quality of the water overall is safe, which Herrera echoed. Herrera says the fixtures will be replaced by the end of the upcoming holiday break.